Shad-bhAgam: The political acts of a king, in their military / political character, that are sAma, dAna, bheda, daNDa, sandhi, vigraham - peace, appeasement, sowing dissension, punishment, peace making, or battling. That being so, here, it is taken to mean one-sixth part levied on total produce, as sages say to rAma in vAlmIki rAmAyaNam – opening chapters of araNya. 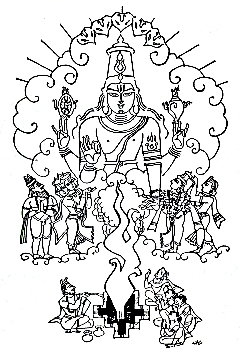 Thus, this is the fifty-first chapter of first canto called harivamsha-parva, in harivamsha-purANa, the sequel of mahAbhArata, narrating the dialog between viShNu and gods regarding the lessening of burden of mother earth.